Tubs and showers come in a variety of shapes, sizes, and surfaces. Tubs can be a stand- alone unit or in combination with a shower. The shower portion can be made from ceramic tile or it can be a single or multiple section unit made from the same or different plastic material as the tub. Tubs and showers can be produced from plastic, metal, or ceramic materials. All whirlpool baths have jets for hydrotherapy. Jacuzzi® is a brand name, and they produced the first residential whirlpool bath in 1968. There are many brands of whirlpool baths or spas (hot tubs). Accurate knowledge of the surface type will enable the proper selection of repair materials and procedures. 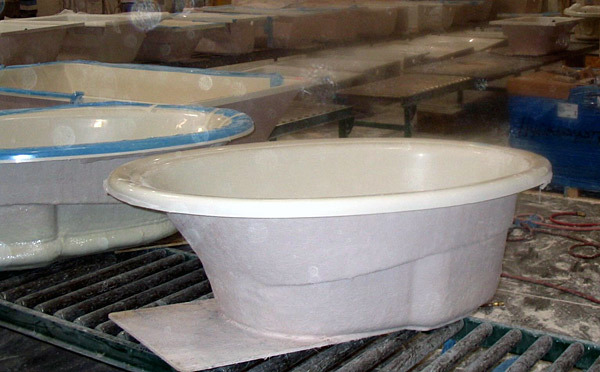 Shower Pans (Bases) are normally produced from acrylic, gel coat, ABS, Vikrell®, or cultured marble. Shower products can be corner units, which are normally either acrylic or gel coat; a one-piece unit, which is gel coat (no top) or acrylic (with top), or a multiple piece unit with each piece made from the same or different materials. Gel coat surfaces, when sanded, emit an odor of styrene. Since continuous cast acrylic has a superior balance of properties, most luxury bath products are produced from it. Multi-Tech Products repair materials can be used to repair many surfaces found in the home, hotel, or apartment. More information on these materials follows. Tubs and showers come in a variety of shapes, sizes, and surfaces. Tubs can be a stand- alone unit or in combination with a shower. The shower portion can be made from ceramic tile or it can be a single or multiple section unit made from the same or different plastic material as the tub. Tubs and showers can be produced from plastic, metal, or ceramic materials. All whirlpool baths have jets for hydrotherapy. Jacuzzi® is a brand name, and they produced the first residential whirlpool bath in 1968. There are many brands of whirlpool baths or spas (hot tubs). Accurate knowledge of the surface type will enable the proper selection of repair materials and procedures.Shower Pans (Bases) are normally produced from acrylic, gel coat, ABS, Vikrell®, or cultured marble. Shower products can be corner units, which are normally either acrylic or gel coat; a one-piece unit, which is gel coat (no top) or acrylic (with top), or a multiple piece unit with each piece made from the same or different materials. Gel coat surfaces, when sanded, emit an odor of styrene. Since continuous cast acrylic has a superior balance of properties, most luxury bath products are produced from it. Multi-Tech Products repair materials can be used to repair many surfaces found in the home, hotel, or apartment.